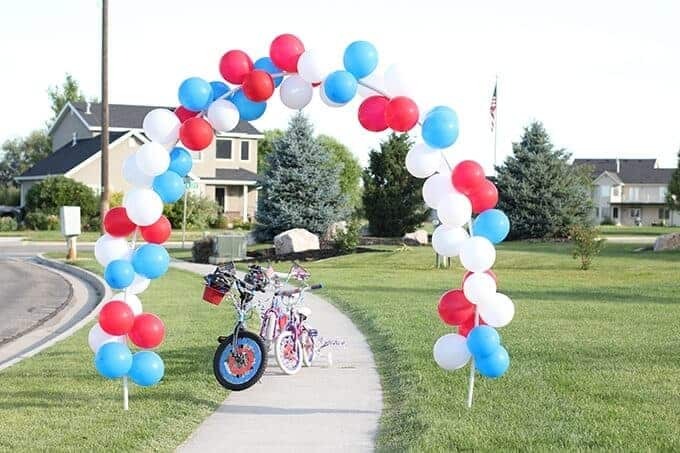 Want to make a balloon arch your next event like a kid’s bike parade? This step-by-step balloon arch tutorial will show you the steps and supplies you need to make one for under $20. Be sure to check out the FAQ at the end of the post for more specific details, plus a free printable shopping list and tutorial! DIY BALLOON ARCH IS EASIER THAN YOU THINK! 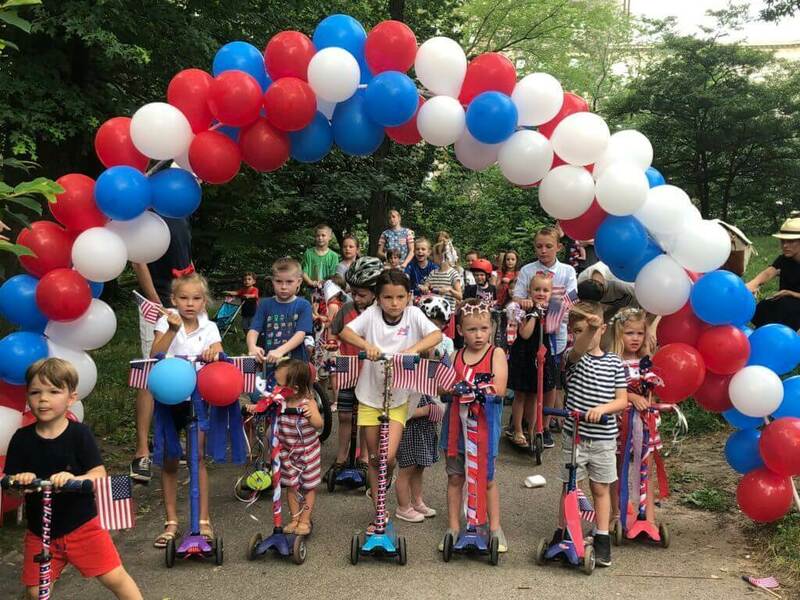 On Independence Day, we hosted a neighborhood breakfast and bike parade. Our church congregation asked us to be in charge of a similar event a few years ago. 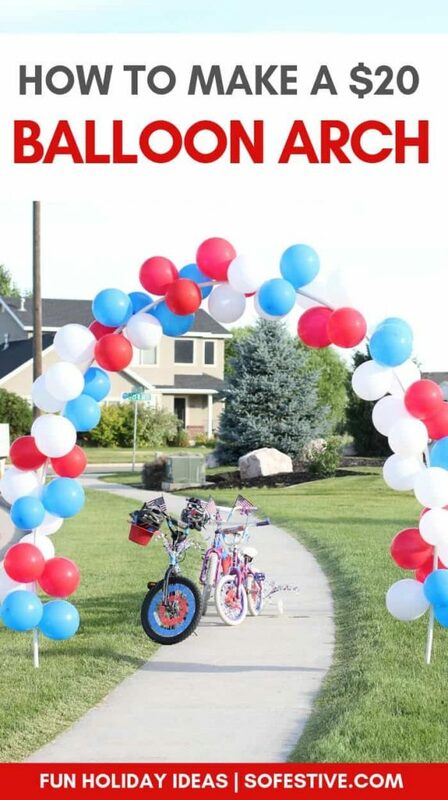 In our effort to make the bike parade a big deal for the kids, my husband and I created a balloon arch that the children could ride their bikes through. The balloon arch was not only super festive, but it was actually pretty simple to make. So this year, when we decided to host another breakfast and bike parade, we knew another balloon arch had to make an appearance. You have to know that when my husband does anything, he goes BIG! And that was exactly the case this year when he decided to make a 30-foot balloon arch. Yes, I had my doubts. I was skeptical. But holy cow, did it wow our little family and friends alike with its big and fun statement it made at our 4th of July party. Well, enough about us. You’re here for a balloon arch tutorial. You got it! 1. Decide which size you are going to make. Our first balloon arch we ever made was 20 feet. It was the perfect size to go across the sidewalk. This was our first attempt and we were pretty proud of it! We’ve learned a few things since then to make the process a bit smoother. This year, like I said, we made a giant arch that spanned our entire driveway. It was 30-feet in length. Huge, and so fun! 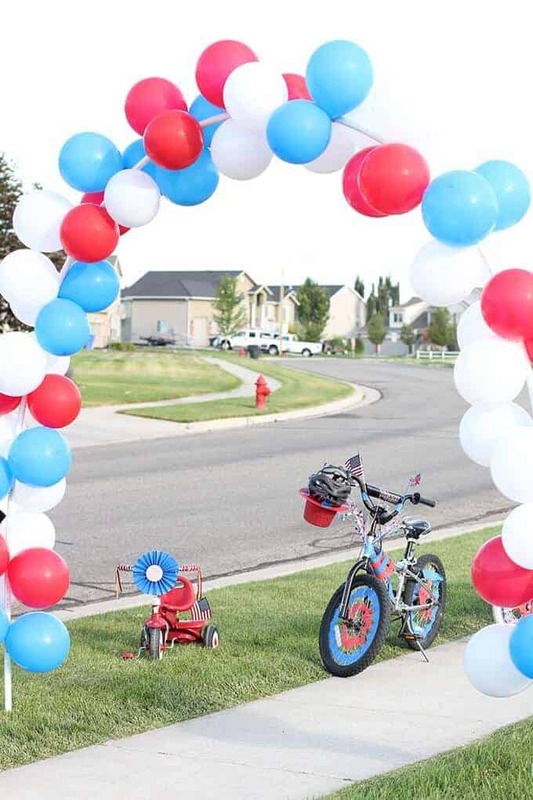 This giant diy balloon arch really made a big statement for our neighborhood bike parade and breakfast. So, first decide where you will put your balloon arch and then you’ll know what size to make. We have always used Home Depot for our supplies, so I know for sure they have what you’ll need. These prices and photos apply to Home Depot, but I’m sure you can find the supplies at a different store if you don’t have a Home Depot nearby. You’ll find the balloon arch supplies in the sprinkler aisle. Tip: Make sure you have a car big enough to transport the 10-feet PVC pipes. If you have a short car, you can open up the passenger window and slide the PVC pipe out. If you do this, make sure you have an extra person to help hold the pipe so it doesn’t slide out onto the road! The cost to make the a balloon arch will depend on the size you choose, but here’s a rough estimate for the 20-foot arch: (of course, these prices were from July 2018 at Home Depot, so they may vary a bit due to season, year, and location). If you choose to make a 30-foot arch or bigger, you’ll just have an extra cost of balloons, coupling and PVC pipe. You can save a little money by purchasing 1, 20-foot piece, but it’s much harder to transport. We bought a coupling tool to remove the PVC pipe once we were done so that we could reuse the parts. This set cost us $5, but you could maybe do without depending on the type of coupling (connector you use). Considering we can reuse all the parts from year to year (except the balloons), a balloon arch is very affordable! I WON’T HAVE TIME TO MAKE AN ARCH. WHAT SHOULD I DO? If you don’t have time to grab the supplies or energy to create your own balloon arch, no problem? You can always grab this balloon arch kit from Amazon right here. Once you have your supplies, your ready to build your arch! Tip: It’s best to have 2 people assembling the arch. Connect the pieces of PVC pipe together with a coupling. Set aside. You shouldn’t need any glue if you get a connector that the PVC pipe can snap in. Find the place you want to build your arch. 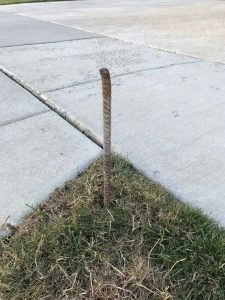 Ideally, you should choose to place it over a sidewalk, driveway or path. Place the 2 pieces of rebar on either side of the path or driveway. You’ll need a hammer to pound it firmly into the ground. This is after the rebar has been placed in the ground: You’ll want to make sure there is at least 12″ of rebar outside of the ground to keep the arch in place. 4. Slide the PVC onto one side of the rebar. Repeat with the other side. You’ll notice in the photo above that the arch is tilted a bit. We intentionally slanted the rebar into the ground that way. But you’ll also notice a heavy duty nylon strong that is attached to the arch. It is connected to our fence gate. There is no way the 30-foot arch would stay up without this reinforcement. If you are doing a 20-foot arch, at this point, you can start attaching the balloons to the arch. You will not need an additional support. If you are making a 30-foot arch, you’ll want to reinforce the middle of the arch to a house, tree, etc so that the weight of the balloons doesn’t pull the arch down. Now you’re ready to attach the balloons! But first, you’ll need to inflate the balloons. There’s no need for helium balloons on this arch, so you can save money by inflating them yourself. We bought a cheap balloon pump which was a lifesaver and saved us lots of time. Had I been smarter, I would have purchased two to make blowing up over 100 balloons go much quicker. We spent about 2 hours blowing up 120 balloons. But that was with a movie on and a few interruptions. So, just make sure you give yourself enough time to blow up the balloons. Tip: Inflate the balloons on your balloon arch site so you don’t have to transport all those balloons. Once all the balloons are filled up and tied, take two balloon and tie them together. Repeat until all balloons are in bunches of twos. Then, you’ll take two sets of balloons and wrap them around the arch until they are secure. 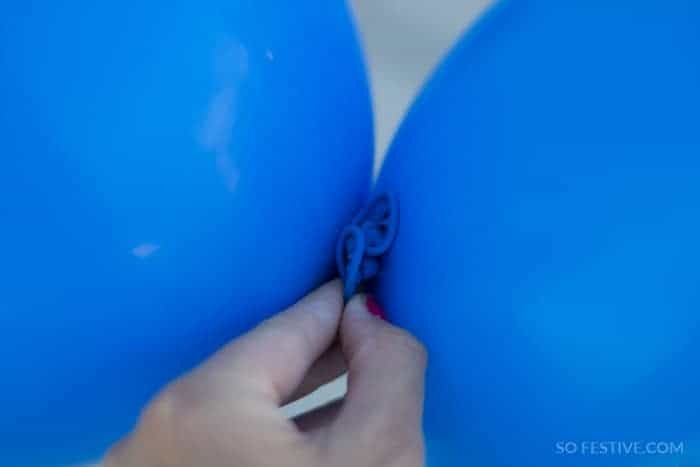 If you do this well, you won’t need any tape to hold the balloons in place. HOW LONG WILL THE BALLOON ARCH LAST? The actual arch will stay up for a while (given there’s no heavy wind), it’s the balloons you’ll need to be careful about. Heat from the sun can cause the balloons to pop after a few hours. So just keep that in mind. 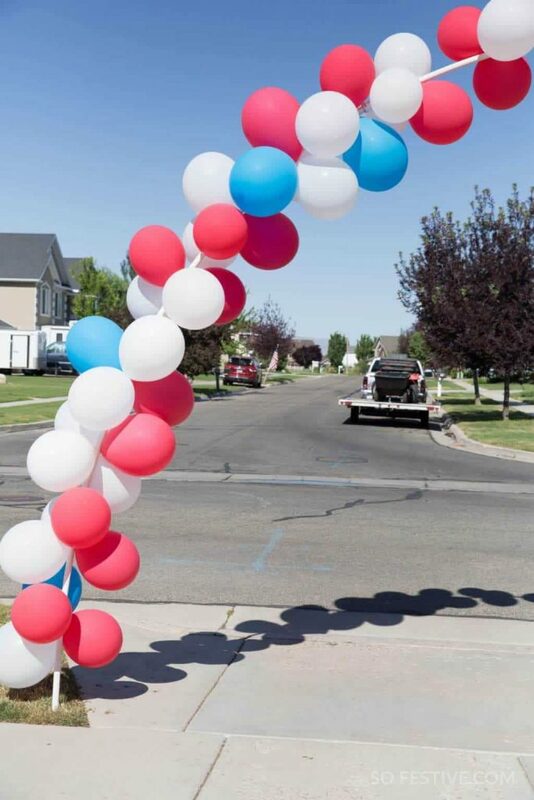 I’ve only made a balloon arch on the 4th of July when it’s really hot, so if you make it in cooler temps, leave a comment and let us know how long it lasts. I’m betting that inside or cooler temps will help the balloons to stay in place much longer without direct sun on them. YOU CAN MAKE A BALLOON ARCH ANYWHERE! Don’t let your location stop you! A Balloon Arch can be set up nearly anywhere! HOW EARLY CAN I SET UP MY ARCH? Your arch can be set up as early as you want, but the balloons should not be put on the arch until a few hours ahead of your event, especially if you are going to put it up on a warm day. DO THE BALLOONS NEED HELIUM? No! You do not need helium in your balloons. The arch will hold the shape alone, so the balloons are merely for looks! Plus, you’ll save a lot of money by not getting helium-filled balloons. HOW MANY BALLOONS WILL I NEED? For a 20-foot arch, you’ll need 70-100 balloons. You can get away with around 70, but if you want the arch really full, you’ll want closer to 100. For a 30-foot arch, you’ll need about 120. A balloon arch will cost you around $20, including balloons. You’ll need 3/4″ PVC pipe, couplings, rebar, and balloons. Secure the rebar into the ground and slide the arch onto the rebar. Attach the balloons to the arch using groups of 2 tied around the arch and each other. Take a lot of photos of your cheap, DIY balloon arch! Backyard BBQ Season is Here! yours looked amazing, too! so full and fun and festive!